No visit to Istanbul is complete without a stop at Gulluoglu Karakoy. This establishment is famous for producing the national pastry sweet since 1949, baklava and it has only one location in Istanbul near the Karaköy Port Authority . The top quality ingredients are provided from all over Turkey assembled into mouth watering baklava, börek and other sweets in the immaculate workshop, couple blocks from the cafe. The self service cafe, with its friendly staff is always busy sometimes having long lines for take outs. Their pistachio baklava is one of the best in Turkey. However these are pretty sweet stuff so eat in moderation. Besides baklava, there are many more yummy and interesting food served in this cafe e.g. the cheese borek and baklava of many different flavors and even ice-cream! The prices are very reasonable and this is self-service, take your pick and weigh in at the check-out counter and pay. A piece of baklava cost slightly more than 1TL and is well worth the price. There is even free water – just get a cup by the water dispenser and dampen the sweetness of the baklava, borek with water. The other good thing about this cafe is its service staff – being the first time trying the well-known baklava, I was overwhelmed by the sight of the range of baklava on offer in store. Within seconds, a staff came by and guided me through each flavor of baklava, how to buy and what he would recommend for a first-timer to the sweet world of baklava. Within minutes, my plate was piled up with sweet treats – borek, baklava and even small pieces of different flavored Turkish Delight (which he offered for me to sample for free)! If you are keen to try out this famous baklava cafe, do note its a little bit off the beaten track – its just a few blocks off the Bosporus Sea. Ask around for Karakoy Gulluoglu and you will be directed to the cafe (most likely they had just finished their own baklava treat). Don’t worry about trying to pronounce the name – just show the shop name and it will get you there. They even had a portrait of Obama made of none other than their famous borek! Baklava is a bit tough to use due to its shape. Seeing that I am photo-trigger happy, the staff even motioned me over to his counter and showed this massive Obama borek portrait. Cool! Another wonderfully delightfully sweet treat (terribly wrong grammar but that’s how I felt after eating these sweet pastries – lost myself there) is the Turkish Delight, otherwise known locally as Lokum. When shopping around the Grand Bazaar and Spice Bazaar or in fact any bazaars, you will be flooded with offers for Turkish Delight – take this opportunity to sample some of them (there are a huge variety of brands e.g. Ali Baba, Hali Baba and all other Babas). 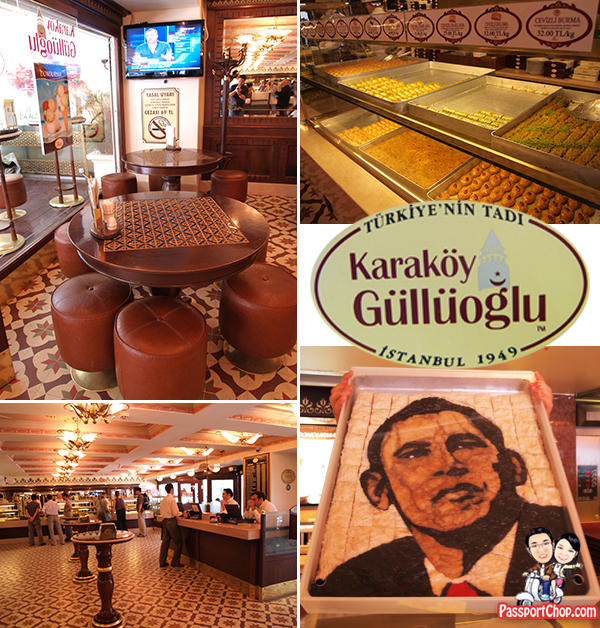 Do just that – sample and then walk away because none of them can beat the original Turkish Delight made by Haci Bekir. 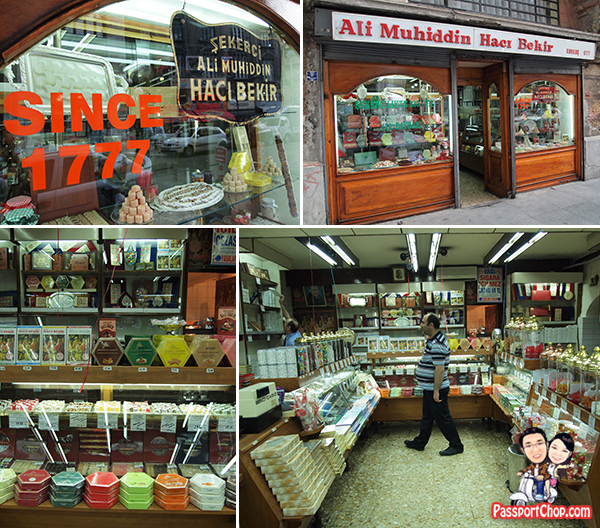 Bekir Effendi (later called Haci Bekir – a title of respect for those who had completed the hac or pilgrimage) invented the Turkish Delight in 1777 and since then his family had been selling this sweet treat as Ali Muhiddin Haci Bekir Confectioners. What’s amazing is that Haci Bekir’s first shop represents the only business in Istanbul which has operated from the same premises for a period of more than two hundred years. You can’t compare this kind of Turkish Delight heritage by any of the other fly by night lokum brands! The shop is a small one and offers other famous sweet treats e.g. the ubiquitous baklava but go straight for the Turkish Delight. You can buy Lokum in bulk at about 10TL per kg (a huge bargain) or in well-packed boxes to bring back home – all at very reasonable prices; slightly more expensive than the other brands but well worth it. Strangely enough, these famous stores are slightly off the beaten track – the nearest tram stop is EMİNÖNÜ but as with other famous stores, ask around and someone will know where it is. There is another store along the famous shopping street of İstiklal Cad. I ate turkish delight before,it’s also in a box like the one here! Last time saw in cold storage,but I don’t think they sell it anymore. Damn yummy! Sorry, the Turkish sweets are too sweet for me. I do like Turkish foods though, namely their kebabs and Ayran. So you also liked Turkey, nice! I´m a great fan of Turkey and turkish people. I found that it´s best to buy turkish delight directly from a special turkish delight store, because the boxes in other stores can have a poor quality (even if the price can be cheap). Have you been in Marmaris, if not you should. 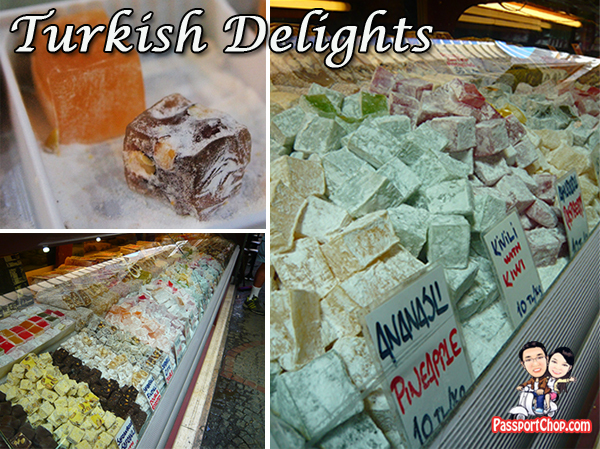 Agree with you on the best place to get your turkish delight. havent been to mamaris. wow you really love baklava. There is one company in singapore that manufacture it. It’s freshly baked and hand made. 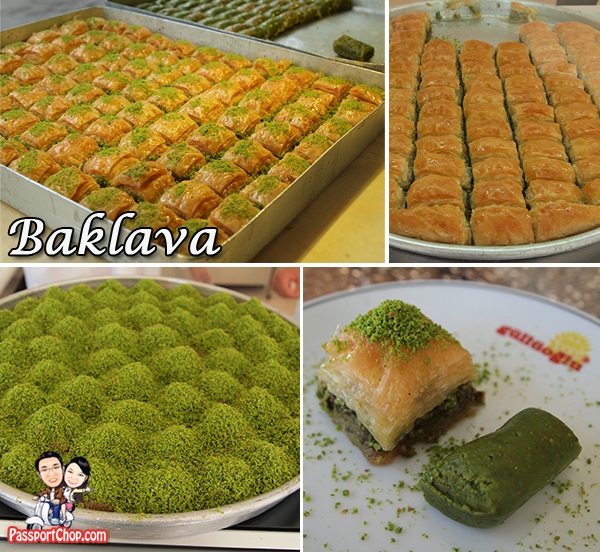 Where to get Baklava in Singapore ? Where to buy good and freshly bake Baklava in Singapore pls ??? sorry i am not sure where to buy. We be aware like Im continuously searching through reason of welcoming things to pore over near by numerous topics, but I be successful to incorporate your own install among my personal scans each and every life time since you provide delivery to compelling records which i look forth to. Looks delicious! I love a good Turkish Delight and baklava and you seem to have found some excellent examples of them. I would love to try them.